Hawk Wargames has announced a new 2-player Starter Set for Dropzone Commander. We got some photos of the contents for it in our GenCon photos from the show. It's pretty awesome. Also, look for a review of it in the next issue of Ravage magazine. 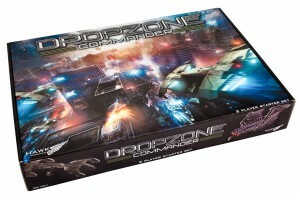 Hawk Wargames is pleased to announce the brand new Dropzone Commander 2 Player Starter Set! It is designed to be one of the most complete wargaming starter sets ever released. Containing two sizable starter forces, the full sized 1.1 DZC Core Rulebook, plenty of accessories as well as a starter battlefield with a set of card scenery, the only other things a new player will need are glue and paints! This boxed set makes a fantastic entry point into the Dropzone Commander universe as well as a great way for existing players to add to the core of their forces. All the 10mm scale miniatures in this box set are injection moulded in plastic. These crisply moulded models feature extremely fine detail, matching Hawk Wargames resin kits in quality. The worldwide in-store release date is September 28th.